If you still have any old £10 notes lying around the house or sitting in your purse, you should probably spend them as soon as possible – as the deadline for spending them is fast approaching! The Bank Of England released brand new £10 notes in September, so they’ve been in circulation for over two months now. The newer £10 note is made of different material, polymer, rather than paper. 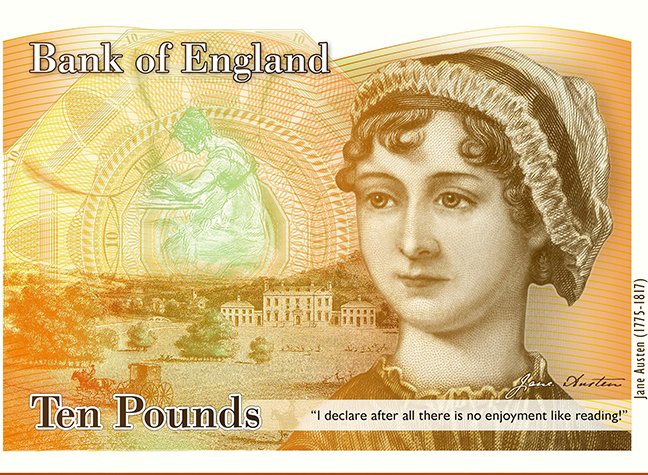 And it also of course depicts the face of acclaimed author Jane Austen. It also features a quote from one of her famous books, Pride and Prejudice, which reads, “I declare after all there is no enjoyment like reading!” They also have a special features which helps blind and partially-sighted people to recognise the notes. However, the quote on the bank note was actually criticised when it was released, with many stating that it had been taken out of context. In the novel, the quote was actually spoken by Caroline Bingley, in a sarcastic tone – someone who had no interest in books at all. Many criticised the Bank of England govener, Mark Carney, for the choice, suggesting it was plucked out of thin air by someone who had little knowledge of the actual book. The old £10 notes have been in circulation since 2000, but now, it seems, their time is soon to be up. Come 1st March 2018, we’ll no longer be able to spend the old £10 notes anywhere, although you will still be able to exchange the notes at your bank. According to the Bank of England, on that day, the notes featuring Charles Darwin will cease to become legal tender, and can’t be used in shops, supermarkets, restaurants or cafes. They also estimate that there’s still around 395 million of the old notes still out there – so make sure to check behind your sofa! The new notes are said to be far more durable than the old ones, and also have a number of features within them that are said to make them incredibly difficult to forge. The phasing out of the old £10 notes of course follows the withdrawal of the old £1 coins just last month, which have now been replaced by the new, 12-sided coin.